We headed South to do some fly fishing, eat delicious food and warm up. The transition from fishing season to winter in Montana can be a hard one. We go from chasing fish every day to a cold, grey winter setting seemingly over night. Don’t get me wrong, there is plenty to do in the winter here in Montana and as soon as we wrap up our guide season we are busy hunting, skiing and enjoying the snow. But going from 8 months straight of fishing almost every day to it’s too cold to fish can be a shock to the system. That’s why we head south a couple of times every winter. Every year for Laura’s birthday (Bozeman Fishing Lodges’ owner) we pack our bags and head for the Louisiana marsh. 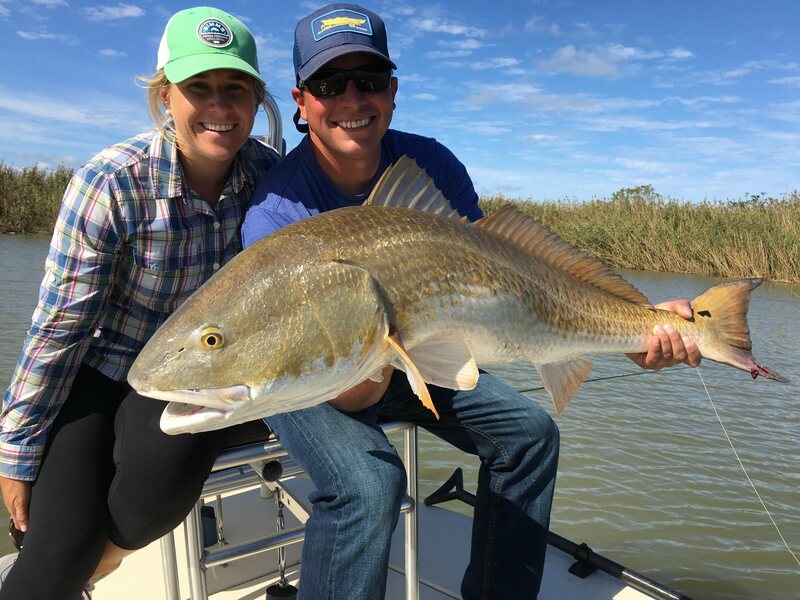 Flying into New Orleans we are able to spend nighttime eating some of the best traditional southern dishes in the world and spend our days chasing big, hungry red fish. Red fishing in the Mississippi river delta is a sight-fishing dream. The shallow tannic flats of the Louisiana marsh seem all too murky to sight fish until you see what appears to be a mix between a pumpkin and a trash bag floating, almost lifelessly in the water. That’s your target. These Louisiana reds are the most honest fish you can imagine; a well placed, well-fished fly almost always leads to an aggressive eat. This year we were lucky. We arrived to calm unseasonably warm weather and it stayed that way for our entire trip… 80, calm and sunny. Our first two days of fishing we spent with our friend and Shallow Water Expeditions guide Jason Stacey. Jason is one of the best fishing guides that I have ever met and one hell of a storyteller too. We fished hard and caught some remarkable fish while poling along grass and cattail islands and in backcountry brackish ponds amongst the maze that make up the Louisiana marsh. We have found through experience that this area of the Mississippi delta has the bigger fish. Over the years while fishing with Jason we have caught several fish over 30 pounds and were lucky enough to do so again this year. Redfish are truly beautiful and hardy fish. Each fish truly has their individual characteristics; the spots on their tail, the color varies, and their eyes are soulful. For our second night in Louisiana we stayed in a remote southern part of the state outside of New Orleans and after a long day on the water in the sun we had some of the best oysters money can buy, fresh out of the gulf. After two days of fishing we headed north, back to New Orleans to fish with another friend and guide, Paul Lappin. Paul guides out of New Orleans and works closely with Fly Water Expeditions. In this area we fished what seemed like a totally different ecosystem all together. We poled around small barrier islands in the gulf looking for both tailing and floating fish in water almost as clear as Florida. The big fish are here, although we only saw a few the day that we fished there this year. But the numbers of fish are there for sure. We caught one over 20 pounds and whole bunch in the 10-15 pound range, great fish and great fishing anywhere. Red fishing to Louisiana is what trout fishing is to Montana, truly world class. Being able to travel south to thaw out and wet our lines year after year is a trip that we both look forward to probably more than any other trip of the year. The target rich environment provides numerous shots and plenty of eats on these amazing fish in an amazing ecosystem. Add to the fishing the excellent food and culture and Louisiana has quickly gotten to the top our annual destinations. I can’t wait until next year!